Supernatural Sisters: "It's a Terrible Life"
This season is killing me! So many great episodes and the stories are amazing! I laughed and cringed through it all with glee. The last names. Sam's visions. Nothing and then just a tiny bit of the Dean we know slipping through. And then, the hope. Again with the Show giving the boys (and us) hope that everything will be alright. 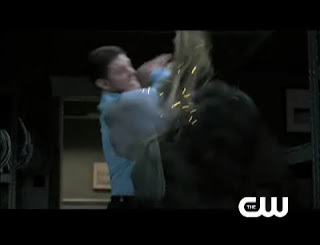 What better way than this to bring Dean back in to fight? My heart is breaking yet happy all at once. Who watched the preview for next week? Anyone? Did you catch the cover of the book? This was without a doubt my very favorite use of the ghostfacers ever. And I think one of the reasons I loved the episode so much was because the boys were working together--even as strangers, they had a better relationship than we've seen in a few weeks. I miss that! But could have done without so much gruesome--ugh. I covered my eyes when the guard was going out the elevator. But when he made it, I lowered my hands just in time to see him reach back in for Sam. Double ugh. I sensed the balding boss was behind it, but when he came back in with a bonus on paper, I sensed demonic. I was afraid the demons were going to try to get him to sign some contract (with uberscary fine print) and keep him in la la land since we now know he's the only one who can actually stop the apocalypse. But I liked that it was Castiel's boss and the pep talk he gave Dean. It was a good ending, but part of me was wondering how Sam took it when he came back to reality, too. Again, we end with them apart--as opposed to when every episode closed with the two of them together in (or sitting on) the Impala. The division between them is clear even in the show structure! Cannot wait til next week's. I totally want a mock up of those book covers from next week. Even if I did see Fabio on one! Next week is gonna be amazing. Although I can't help make a comparison to Heroes. Phouse, the hope was SO needed at just this moment, for us of course, as much as the boys. I died when I saw the first book cover. Even my daughter was cracking up at Fabio. Tanya, I'm with you on the self-irreverence. I don't know how Sam said that line with a straight face. Ditto about the gruesomeness. My husband, who was the one who originally suggested Number One would like the show, keeps berating me for letting her watch such things. She's not bothered by it--and that's the problem! And yes, the boys working together was such a relief, at least temporarily. It just struck me--Zachariah could have done it differently, could have just done Dean's life and left Sam out of it, especially after what Castiel saw him do. But he didn't, he made Sam an intrinsic part of the "what you are meant to do" thing. That's encouraging, despite the boys being apart at the end! Gah, yes, Terri, Dean did clean up awfully nice. :) And I think I forgot to mention--the way the episode was lit, his EYES were so GORGEOUS. It killed me over and over again. Just another thought because I can't stop thinking about this episode - since Zach had Sam & Dean working together, maybe that was a way to tell them BOTH that that is the way is SUPPOSED to be. They need to work together even if it is Dean's destiny to stop the end. Speaking of which, I think I might like that both boys have a destiny. It's not just Sam like it was in the first 3 seasons but now Dean is a huge part of "the" destiny. And if it means we get to see Dean cleaned up and Jared bloody even one more time? I love it! Amused by my word verification: refang. That makes my imagination run away. Hi.. loved reading your detailed analysis of this episode! I usually watch this show with my dad and my teenage brother, who watch it for the ghouls and bloodshed, and I was of course delighted to see Jensen all dressed up and pretty. The latte steaming was hilarious, and so was NPR Morning edition (that's what I do every morning!). The episode aside, Jensen displayed some awesome acting once again. In addition to the gradual cracks from Dean Smith to Dean Winchester, there was that one moment where Zachariah says "you get to (something) and fornicate with women", and Dean is turned away from Zachariah and facing the camera. He has this expression on his face like "Hmm... you have a point there"... HIL-A-RIOUS! Anyways, keep up the blogging. I've loved this show from day one, and hope Jensen graduates to other shows or movies so I get to see his acting skills go in different directions. YES! I think you're right. Terri, I can find some archives for some TV bloggers who all did a site visit in season 2, I think--e-mail me if you want me to look them up. If you're not aware already, Jensen was in Ten Inch Hero, a NOTHORROR movie that's available to rent at Blockbuster and will be on sale here next month. He was spectacular in it! Okay, maybe it's the drugs the doc has me on, but I didn't get the Smith and Wesson thing until I just read your post (hanging my head in shame). There are what I perceive as shout-outs to Office Space in this. The TPS reports from Office Space are classic, as is the beating to death of the printer that refuses to work -- like the other reports and the poor guy's computer that loses his work in this episode. Plus, just that feeling of drone-dom for people who work in cubicles. Also, there's the thread of stealing from the company. 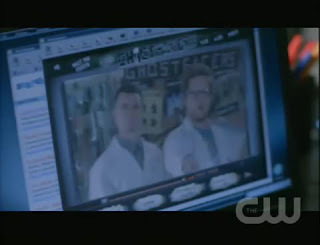 So many funny moments in this episode -- loved that they were following the Ghostfacers' how-to tutorials. LOL! I really liked the ending because it surprised me. Didn't see it coming. Thanks, Nat. I found all the 2007 set visits and the pics were a big help. I'm still going to hunt down more if I can. "You get to drive a classic car and fornicate with women." LOLOL-forgot about that line. Tanya, the demon ending would have been great, too! I covered my eyes on the elevator thing, too. I saw the cover of the book for next week-looks way fun! How funny was that?! LOL. Definitely loved the episode. I'm glad it was a step off from the depressing eps lately (although I do have to say, some of the lines recently have me cracking up. "Uriels the funniest..." was one of my favorites) Anyway... I knew there was something (other than the obvious) about this ep that bothered me. I didn't get it until I read your post, the color was off! It totally threw me. *Slaps head in complete shame* How did I not notice that?!? I did really like the fact that Sam was a part of Deans realization that he was meant for something more. Dean would never have thought of hunting the ghost without Sam saying something. 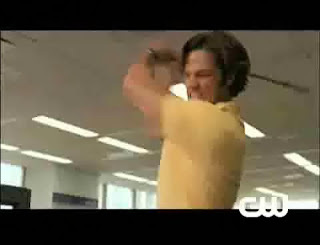 Sam was gorgeous in his polo! 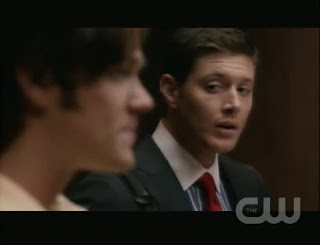 Although, I thought it was interesting that he was the tech help guy, and Dean was in the "manager-esque" role considering Sam's previous education. Could it be another thing that shows the change in his character? Or maybe I am looking way too much into it. Sorry about the uber long post... I just loved the episode! I didn't get it until I read your post, the color was off! It totally threw me. *Slaps head in complete shame* How did I not notice that?!? I have found myself saying "Right" way to much now. And did anyone else want to fix Dean's hair? and Dean was in the "manager-esque" role considering Sam's previous education. I think it was probably reflective of Dean's "destiny," which he will need to be in charge of. Sam's by no mean's a grunt in their relationship, but Dean has usually been the leader, so maybe it was a comfort/reminder thing. I remember thinking the lighting was like a regular show, and when Zachariah touched Dean's head, boom, back to "normal." I thought this mirrored their real-life attitudes toward being Hunters. Sam has accepted his demon blood and is content to use it to fight evil. Dean, as you said, has refused the call. So, Sam doesn't need to face that destiny since he's already embraced it. I really thought this whole test was mostly for Dean, not so much for Sam. Great post! Love this blog. No, you're right, Lisa, it was a test/message/lesson for Dean, not Sam, but I just hate the growing distance between them and even if Sam wasn't present for the Zachariah speech, I wanted him to be not far away. If that makes sense. LOL So often we don't get to see the aftermath of these big things. Just once I'd like Sam to be nearby.